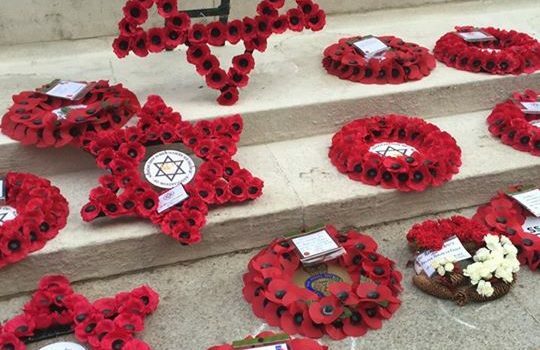 The South African Legion UK Branch , took part in this years Jewish Ex-Servicemen and Women Annual Remembrance Ceremony and Parade at the Cenotaph in Whitehall London. The reviewing officer was Field Marshall The Lord Guthrie of Craigiebank, and the Ceremony was conducted by Chief Rabbi Ephraim Mirvis, Rabbi (Major) Reuben Livingstone and Rabbi Harry Jacobi. The South African Legion were made to feel welcome and we were thanked by Parade Marshall Ronald Shelly MBE for attending and showing our support. Special thanks to Peter Gillatt and Theo Fernandes who carried the SA Legion Standards, and Andrew Bergman who helped me with the Hebrew inscription on the wreath card.